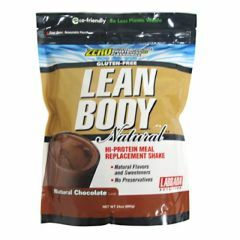 AllegroMedical.com presents The Labrada Nutrition Lean Body Natural - Natural Chocolate Protein Supplement Gluten Free. Hi-Protein meal replacement shake. Natural flavors and sweeteners, no preservatives. Lean Body® Natural MRP Shake – Supports Lean Muscle, Helps You Burn Fat, and is the quick nutrition solution for athletes and fitness enthusiasts with little time to prepare meals. Here's what you get in Lean Body® Natural MRP Shake: • 50/30/20 (protein/carbohydrate/fat) ratio of macronutrients consisting of highly bio-available, time-release proteins, high-fiber complex carbohydrates, and essential fatty acids, for nutritional support, and higher energy, all day long! Glass- fill glass with 5-6 oz of water or your favorite beverage. Add 1 scoop (40g) of Lean Body Natural, and mix with a spoon. Shaker- Fill shaker with 5-6 oz. of water or your favorite beverage. Add one scoop of Lean Body natural and shake. Blender- Fill blender with 5-6 oz. of water or your favorite beverage (for a creamy ice cream flavor, add a handful of ice cubes). Add 1 scoop of Lean Body Natural, cover and blend for 20-30 seconds. LeanPro Cross-Flow Micro ultrafiltered Whey Protein Concentrate, non-dairy creamer (sunflower oil, calcium caseinate), cocoa powder, FiberPlex (polydextrose, fibersol-2, cellulose gum), organic evaporated cane sugar, natural flavors, xylitol, sea salt, MCT oil, Monk Fruit Extract, stevia.